Mark Edwards was born in 1951. In 1967 he went to study at Medway College of Art, and continued with his studies at Walthamstow College of Art in London. Impatient to start the career as an artist Mark did not complete his degree. Instead, Edwards taught drawing at the local adult education centre, whilst painting and displaying his contemporary art work in local galleries. In 1974 Mark Edwards took another spontaneous decision in his artistic career. With the active support of his future wife Sally, they bought an old car and then drove to a remote cottage on the shores of Scottish Loch Hope. The landscape was inspiring being surrounded by the dramatic mountains of the North Coast in the Scottish Highlands. It was a brave move which gave Mark the freedom and space to pursue his artistic ideas. Over the decades Edwards regularly exhibited at Scottish art galleries, supplementing his income by working as a gillie during the deerstalking season on the Duke of Westminsters estate. In 1984 Mark Edwards was signed to the London agency Artist Partners. Following this he illustrated literally hundreds of book covers for authors such as Kingsly Amis, Beryl Bainbridge, Sue Townsend, Philip Pullman, Michael Morpurgo (including War Horse) and CS Lewis (Narnia Chronology). Mark Edwards's varied illustration technique has, with other international illustrators, been analysed in 'The New guide to Illustration' (Phaidon Press 1990). In 2007 Mark Edwards decided to change direction from his successful deer stalking and fishing paintings. As he says: "So instead of placing a deer in the wood, I came across a 1950's photo in a magazine of a man reflected in a window on a busy New York street dressed in a bowler hat and coat, so I placed him in the wood. Instantly there was an immediate tension: what was he doing there?". This was the beginning of Mark's highly successful 'White Wood' series of paintings. Mark Edwards White Wood paintings are very much in the tradition of British surrealism. In a wintery forest mysterious men wearing large overcoats and bowler hats stand in woods. Steam trains and railway architecture appears in the landscape. But why? It's a mystery .... and a compelling one that continues to appeal to collectors throughout the world. 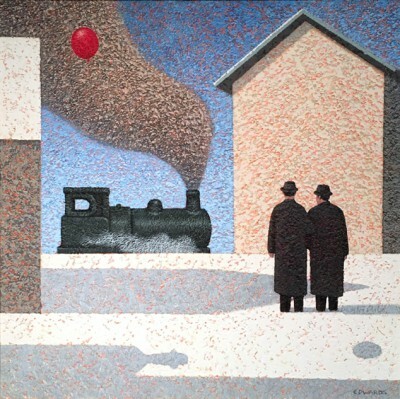 In addition to Red Rag art gallery Mark Edwards art work has been exhibited at other leading British Art Galleries. Each painting at Red Rag is sourced from the Mark Edwards artist studio and like all Red Rag British art and Contemporary art it can be shipped worldwide.